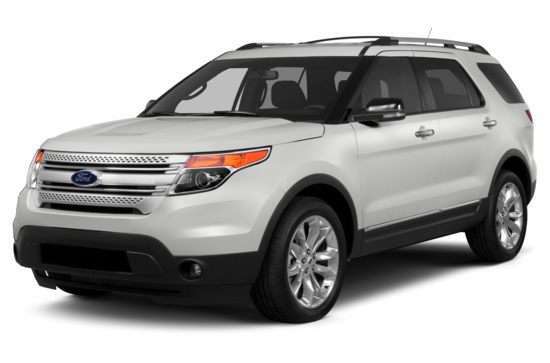 A new Appearance Package is available for the 2015 Explorer XLT. It adds leather with synthetic suede inserts, heated front seats, 20-inch aluminum wheels, and special exterior trim. Three new paint colors also debut for 2015. Four versions of the 2015 Explorer are on sale: Base, XLT, Limited, and Sport. Most versions of the 2015 Explorer have a standard 290-horsepower, 3.5-liter V-6 engine. The Explorer Sport gets a twin-turbocharged, 3.5-liter EcoBoost V-6 good for 365 horsepower and 350 lb.-ft. of torque, the latter peaking at a low 3,500 rpm. Both engines are bolted to a 6-speed automatic transmission with SelectShift manual gear selection, and the Explorer Sport also has standard all-wheel drive. A turbocharged, 2.0-liter EcoBoost 4-cylinder engine is optional for front-drive versions of the Explorer. It makes 240 horsepower and 270 lb.-ft., with torque peaking at 3,000 rpm. A 6-speed automatic without SelectShift capability is standard for the turbocharged Explorer, and AWD is not available with this engine. The Explorer’s standard V-6 engine gets 20 mpg in combined driving with FWD, and 19 mpg with AWD. Upgrade to the Explorer Sport, and the EPA says you can expect to get 18 mpg. Alternatively, choose the smaller 2.0-liter EcoBoost 4-cylinder engine for 23 mpg. Standard MyKey technology allows parents of young drivers to program speed warnings and limits, stereo volume limits, and to mute the stereo until the seat belts are buckled. All but the base Explorer include Sync smartphone connectivity with 911 Assist, which works to speed rescuers to the scene of an accident as long as a paired device is aboard the vehicle at the time of the collision. Additional safety-related options include a reversing camera, a Blind Spot Information System with Cross-Traffic Alert, a Lane Keeping System, Adaptive Cruise Control with Collision Warning and Brake Support, rain-sensing wipers, automatic high-beam headlights, and inflatable second-row seat belts. According to the NHTSA, the 2015 Explorer gets a 5-star overall crash-test rating. The Insurance Institute for Highway Safety (IIHS) gives the Explorer top marks except in the small overlap frontal-impact test, in which the SUV receives a “Marginal” rating. Front crash prevention is rated as “Basic” by the IIHS. Every Explorer is equipped with Curve Control, which helps the SUV get around a corner or curve if the driver is going too fast. A Terrain Management System is included with AWD models, featuring five different traction settings. A Hill Descent Control system is also included with AWD. The Explorer’s Sync system includes Bluetooth calling and music streaming, reads incoming text messages, and responds with pre-set text messages. Add MyFord Touch to the Explorer for a Wi-Fi hotspot operated through a connected phone, three years of Sync Services, and expanded voice control and text messaging options. The Explorer is also available with optional Active Park Assist, which steers the SUV into a parallel parking space while the driver operates the pedals and transmission.